The rate of adult smokers has dropped by more than half from 1965 to 2013, according to the Centers for Disease Control and Prevention. But smoking and the cancers it causes are hardly a thing of the past. “Most people don’t realize that there are still more than 40 million smokers in the U.S. and that lung cancer kills about three people per minute in the world,” says Stephen Hecht, editor-in-chief of Chemical Research in Toxicology and a former associate editor of the Journal of Medicinal Chemistry. He researches how tobacco ingredients cause cancer in humans—and how to prevent it. Hecht is the Winston R. and Maxine H. Wallin Land Grant Professor of Cancer Prevention at the University of Minnesota’s Masonic Cancer Center and Department of Laboratory Medicine and Pathology; he is also a member of the graduate faculty in the Department of Medicinal Chemistry, and was program leader of the Carcinogenesis and Chemoprevention Program of the Masonic Cancer Center from 1998-2014. 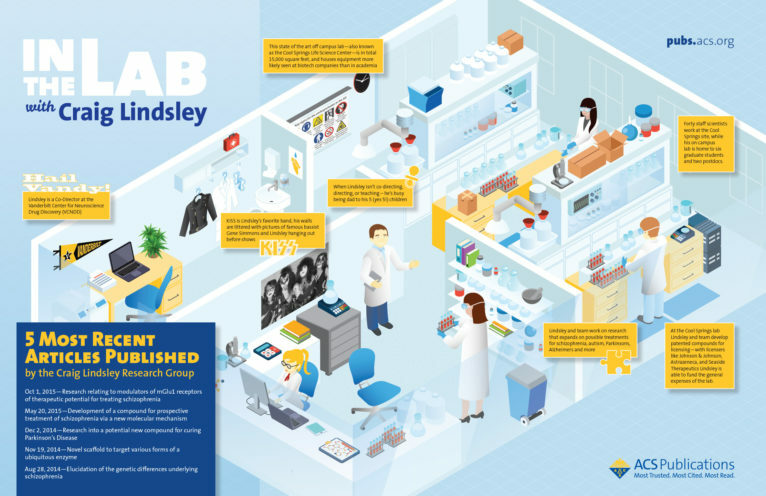 His lab is located in the university’s new 280,000-square-foot Cancer & Cardiovascular Research Building. Hecht’s group has published over 800 papers on everything from basic discovery to human clinical studies. Hecht’s lab is recognized as one of the best in the world at studying how tobacco-specific nitrosamines—known as a cause of cancer—turn healthy cells into cancerous ones in humans and animals. His team has elucidated the structures of multiple DNA adducts, the harmful covalent bonds between genetic material and carcinogen that can be the start of a cancerous cell. One recent paper produced from this work won an ACS Editor’s Choice award. Studying diverse populations is important to Hecht. “Our data provide a partial explanation of why African Americans have a higher risk for lung cancer than whites, while Japanese Americans have a lower risk,” he said. Looking at other possible points of exposure to carcinogens is another key interest. For example, one study found elevated levels of acrolein and crotonaldehyde metabolites in non-smoking women who do wok cooking. He is also undertaking large quantitative studies—using mass spectrometry—of toxicants and carcinogens in the urine of tobacco product users and people regularly exposed to secondhand smoke. Perhaps most exciting is the lab’s research into cancer-preventing compounds, which they have found in cruciferous vegetables like watercress, cauliflower, and broccoli. These studies have involved both animals and human clinical trials. Hecht’s team also provides policy advice, supplying further evidence to support regulation of existing tobacco products and evaluating the carcinogenic potential of new products. The lab also collaborates with specialists in other fields, including genetics, biochemistry, and psychology, to identify who is susceptible to tobacco-induced carcinogens and why. When he’s not in the lab, Hecht enjoys playing tennis and watching major league baseball. But he cheers for the Boston Red Sox, not his hometown Minnesota Twins (perhaps a holdover from his days as a graduate student at MIT).